I’ll start by saying that hiking this volcano will change your life. 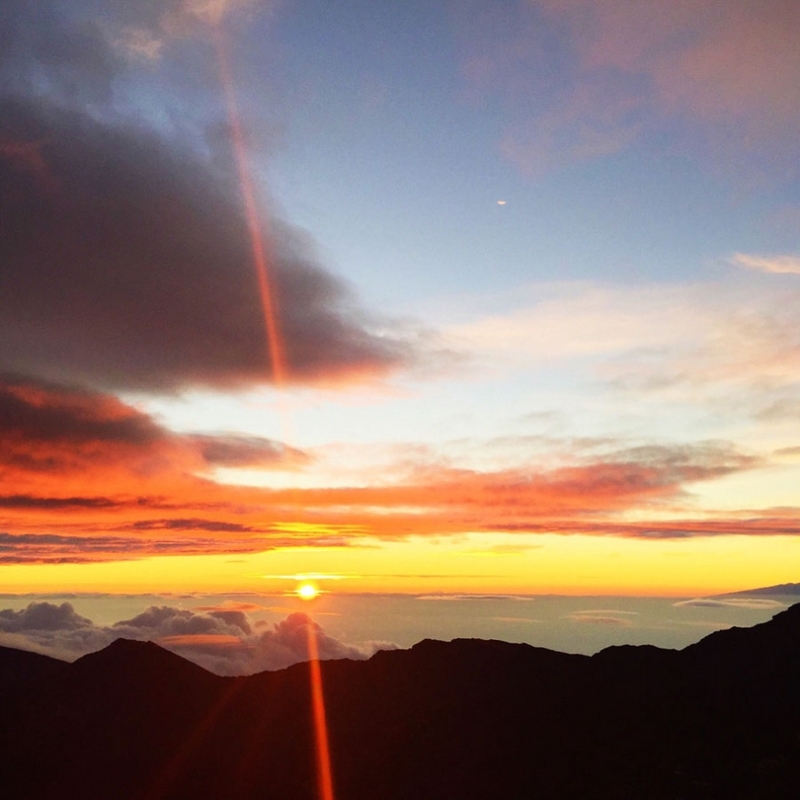 Haleakala, on the Maui island of Hawaii is the world’s largest dormant volcano. It’s a National Park and a United Nations International Biosphere Reserve. We decided on the 2 night, 20 mile round trip, spending the first night at Paliku and the 2nd night at Holua. You can reserve cabins which looked really amazing but we opted to do it true backpack style and tent it. Flying from California to Hawaii with the sole intention of hiking this was a bit stressful as we watched weather sites insist it was going to pour buckets the entire time we were planning on being there. Now I’m not one to run from rain but I am no a fan of hiking for hours in heavy drops and trying to set up a tent in a tropical downpour. We ended up seriously lucking out as it only rained on us once, approximately 10 minutes after we set up tent at Paliku. Having a post hike nap snuggled next to your best friend nestled in the crevice of tropical, volcanic mountains was nothing less than spiritual heaven. This link from Unreal Hawaii was our inspiration and guiding light when planning our journey into the volcano. You do have to start at the headquarters and get a permit as well as watch a 10 minute video on how to respect this delicate ecosystem. Completely common sense to most outdoorsmen/women but required nonetheless. Apparently Haleakala is still considered an active volcano by most scientists and has erupted over 6 times in the past 1000 years. I mean…if I’m going to die, please let it be hiking in a volcano. Of course what should follow 20 miles of hiking in and our of a volcano but a fancy schmancy stay at The Andaz Maui. You’ve got to reward yourself in life a little, right? Ok I’ll stop talking now and just show the amazingness that is this volcano. 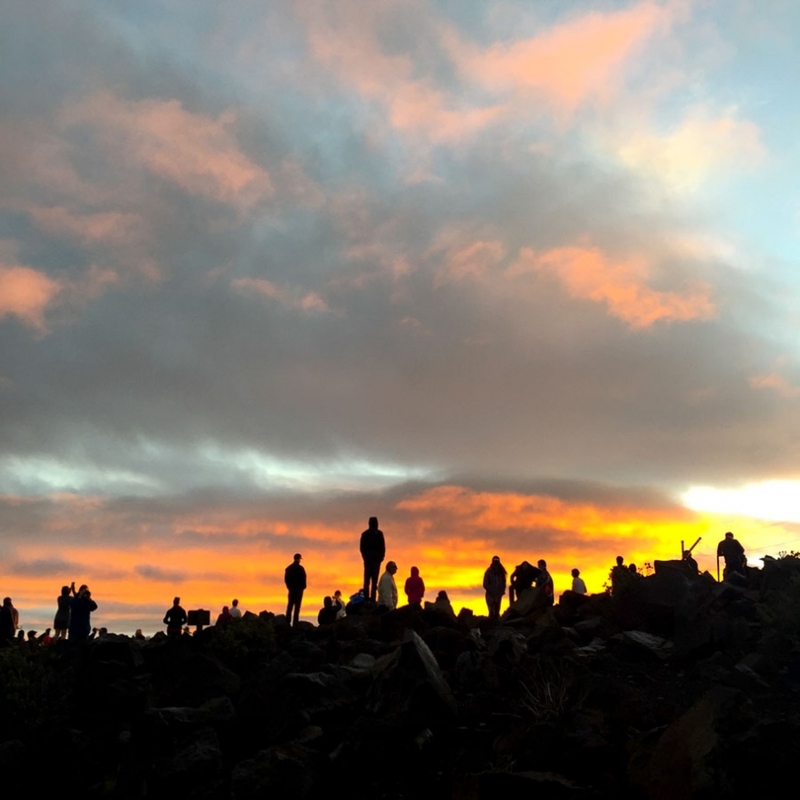 The ridge will be packed with folks watching the sunrise. Luckily 99.99% of the people there will not be venturing down into it. 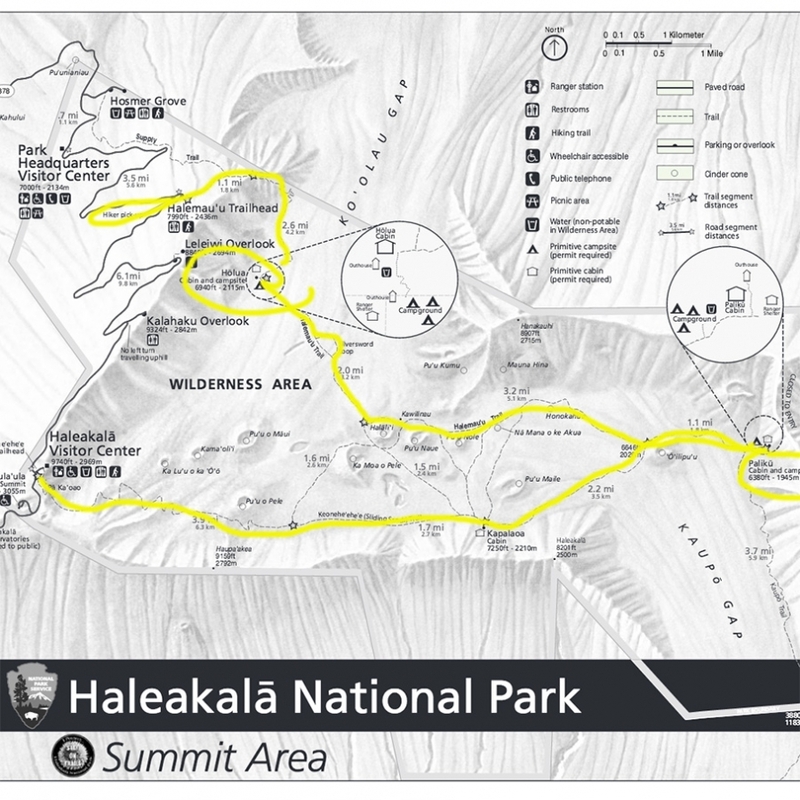 Haleakala means “house of the sun” which is clearly the perfect name for her. See that beautiful fog just hovering below the ridge….ya we will hike right through it. The first leg of the hike to Paliku is 10 miles of the the most beautiful and varied terrain I’ve ever seen in one hike. This was taken in the first few miles of dropping into the volcano below the fog layers. Camp at Paliku. The hillsides of Paliku…can you beat this view? No, no you can’t. It was suuuuuuuper damn with the rain and moist air but oh so beautiful when the sun poked out to light up the dew drops. Ok so I hate geese…like HATE….GEESE. But for some reason, the Nene birds of Maui didn’t bother me one bit. Maybe it was the magic of the Polynesian gods or the fact that they are super sweet and friendly and sound like baby cows when they talk to you. Either way….we had fun with them. Laser light show in the tent. See how far ahead of me he gets when it’s selfie time? Day 2 of the hike from Paliku to Holua. This particular stretch was sooooooo incredibly quiet. The peacefulness and solitude we experienced down there was an unparalleled experience. The terrain continues to vary mile by mile. Setting up camp at Holua. The hike from Paliku to this site was about 6 miles and was to me, the most incredible portion of the trip. The cabins are actually at the bottom of the hill and we much preferred the view from the tent sites here. Morning sunrise from Holua. The last portion of the hike ia about 4 1/2 miles of straight uphill switchbacks which made for stunning views and burning quads. And finally…reaching the top and the views (ok obstructed views) of the Pacific Ocean! Triumph! After some trusting soul risked their lives to pick us up, we grabbed the car at headquarters and headed straight for beer. Just what the dr ordered! We were highly impressed with the Andaz Maui and would stay there again in a heartbeat! And how about we end on a completely immature, no way in hell can you actually drink beer underwater, why are our sunglasses on, shot. Aloha. © 2019 Clark Family Diaries|ProPhoto Photography Website by NetRivet, Inc.